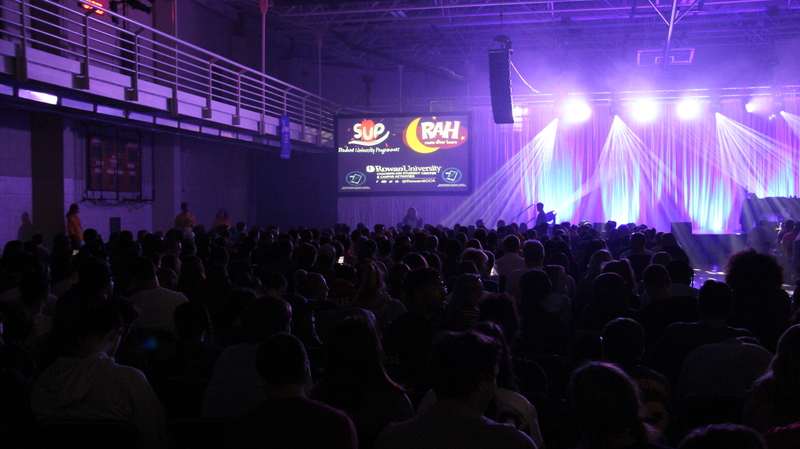 Co-host and writer for Saturday Night Live’s “Weekend Update” and Emmy Awards host Michael Che performed Saturday, Sept. 22 in the Esby Gymnasium. The event was received by a crowd of students and alumni who nearly filled the entire room. Few topics were off-limits. At one point, Che even joked that most puppets from “Sesame Street” have autism. Not even Superman was impervious enough to miss being one of Che’s topics, much to the delight of sophomore chemical engineering major Marissa Martine. As the night wound to a close, Che outsourced his act to several Rowan students. Inspired by Che’s willingness to interact with other members of the audience, senior biomedical engineering major Melissa D’Alia asked what advice he would give to aspiring comedians — which led to Che pulling her up on stage to perform a few jokes of her own. D’Alia had never intended for her question to turn her into part of the act, but couldn’t be more pleased with the result. Her on-the-spot improv act consisted of anecdotes about her parents being unhappy with her relationship status (or lack thereof), and her father even suggesting that she eat more Popsicles in the direct view of eligible young men. Che enjoyed his time at Rowan so much that the event ended up going almost half an hour over the scheduled time. The show was received with immense enthusiasm, with no shortage of students eager to talk about their great experience. Senior Sarah Kalman left with a big smile from the show. “[This was] definitely one of my favorite Rowan events…seeing him doing standup in the middle of our stinky… [little] gym was honestly surreal,” Kalman said. Additional reporting by Arts & Entertainment Editor/Tara Lonsdorf.